We do our best to ensure we operate a quiet Resort. Quiet time is all the time. We strive to make your stay as enjoyable as possible. If you have any questions, please email chris@dutchlake.com. NOTE: If you are a work crew booking cabins, please email admin@dutchlake.com prior to booking. 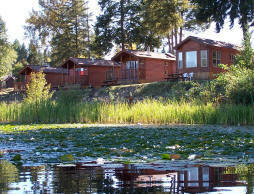 All lakeside cabins at Dutch Lake Resort are equipped with dishes, pots, utensils, linens and towels. less than 7 nights. Clean towels and cabins supplies can be replenished daily from the office. CABIN CANCELLATION POLICY: If you cancel your reservation MORE than 30 days prior to your expected arrival date, the advance deposit is forfeited. Cancellations made less than 30 days prior to your arrival will result in forfeiture of the full amount of days booked. In the event that a reservation is altered by either a later arrival date or an earlier departure date, there will be no refund made to charges already put through on your credit card.